Creating budget item templates allows you to use the template if you want to bill the same activity again. This will save you time as you won’t have to create a new budget item. 2. Click on New to create a new budget item template. Name and Description – Give your budget item a clearly distinguishable name so you will be able to identify it easily later on. Add a description with additional comments or information if necessary. Quantity - Define the quantity of an item, e.g. if you want to bill 90 minutes as a consulting hour, then specify “1.5”. Defining the purchase and sales prices for the budget item enables you to save time as this information will be filled in automatically when you create a new budget item from a template. You can create, edit or delete already defined pricing units. 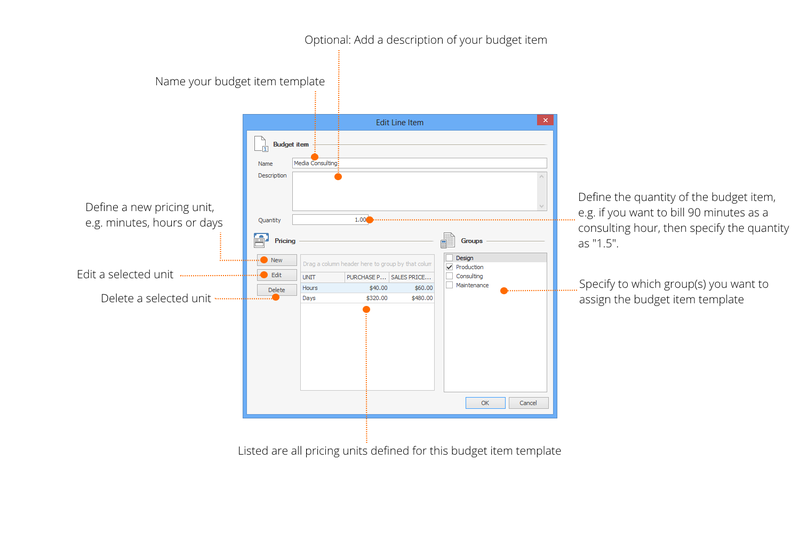 Specify to which groups you want to assign the budget item template. You can choose more than one. It’s important to choose at least one group, otherwise you won’t see the template when you create a new budget item in Budgets. 4.Click OK to save your new budget item template. Budget items - InLoox • Copyright 1999-2019 © InLoox, Inc. All rights reserved.